The hearing was scheduled for two hours but lasted about four and a half hours---non-stop. There were four panels and a public comment period. Please see the agenda for details. Jerry Brown announced 100 Million cut for UC, 100 Million Cut for CSU and 102 Million Cut for Commuity College System. President Yudof offers his normal stirring response. UC Berkeley announces fabulous new financial aid plan where middle class families would contribute up to 25% of their gross family income to attend a public university. Cornell announces new campus in NYC. Apparently, Cornell's president doesn't think that Universities' tech sectors are as subservient to business as they should be. Nancy Scheper-Hughes reflects on the decline of the public university. Washington State tries to imitate the UK in having the state and business choosing which subjects students should study. Oh, and they will continue to pay more tuition no matter what they choose. In Colorado, students are paying more for public universities than ever. And going deeper into debt. Cooper-Union thinking of rejecting 150 years of history and charging tuition. Sound familiar? And yet my optimistic spirit tells me we must continue to fight in the belly of the beast if for no other reason than to force transparency where and when we can, to redirect the wheels of the contemporary version of the odious machine Mario Savio described so long ago, and to support those students who will undoubtedly rise up from January through June to protect their future. Wheeler Hall, UC Berkeley, December 7, 2011: This panel has been asked to talk about how far we've come since the Fall of 2009--and where we're headed. When I spoke in Wheeler Hall two years ago today, December 7, 2009, I asked Berkeley students to connect the dots between their ever-rising tuition, widening income gaps in California, and the then-dominant belief that educational attainment both explains and justifies these gaps. Two and a half years ago, in July 2009, the Regents of UC granted emergency powers to UC President Mark Yudof under the guise of freeing him to deal with an ostensible budget crisis. There are a number of ways to frame what has transpired—ways to plot the diverse elements and track the various trajectories set in motion by the actions undertaken in the name of this budget crisis and in opposition to them. And there are a number of ways to categorize or label or, to use the terminology I offered elsewhere, a number of ways to caption the situation in its totality or to caption notable moments, elements, and/ or events in it. The moment we’re in right now is auspicious, fragile, and surprisingly well-defined. The thing that strikes me most about the moment is how much it is a particular moment, with specific characteristics and borders. It appears as the clearest-looking and most pregnant moment since students starting taking action in Fall 2009. It’s the moment we’ve hoped to attain since Fall 2009. And now that it’s here, it won’t last long. In Fall 2009, UC’s upper administration must have assumed that they could wait out the student movement. This assumption has been proven false by a relatively small core of student activists who weathered a very difficult year in 2010-2011. What resources does the administration have for surviving the student movement, so that it can go ahead with privatization? (1) The frequent and intimidating use of the UCPD; (2) the criminalization of protest, including prosecution in criminal courts; (3) control of the UC bureaucracy; (4) a media strategy of deflecting attention to the Legislature (a strategy whose logical end would be the headline “Regents On Same Page with Angry Mob”); (5) unlimited funds at their disposal to pursue 1-4. But we have seen the weaknesses in these strategies. This logic occludes the serious crisis for graduate programs produced by skyrocketing tuition, a crisis that exposes the folly of privatization strategies and that cannot be solved by intensifying them. November was a good month for the free speech dimensions of the Occupy movement. Police brutality at UC Berkeley and UC Davis was denounced on an international scale, the outrage forced formal investigations to be convened, administrators at Davis suspended several police perpetrators, the Berkeley faculty senate censured some administrators, and the University president and the chair of the Board of Regents affirmed rights to certain kinds of protest. Beneath the surface, protest and speech issues have not been resolved. Four days after the Davis incident the Riverside campus proposed protest guidelines that demand prior approval for everything including the size of protest signs (you can sign a petition protesting the protest guidelines). UC officials still reject occupations. And November was a very bad month for Occupy encampments around the country and for American civil liberties on a number of fronts. Last Wednesday (December 7) qui parle, Reclamations, and Representations organized a public forum on the present crisis, ongoing protests, and future prospects of the public University. Each Journal has recently put out a special issue on the topic: qui parle's "Higher Education on its Knees," Reclamations' "Generation of Debt," and Representations' "The Humanities and the Crisis of Public University." But the talks were not simply about the special issues. Instead they ranged farther afield to address the questions of where we are and what is to be done. We will be publishing texts of talks from the Forum this week. We will begin tomorrow (December 12) with James Vernon's Introduction to the Forum and Chris Newfield's presentation, and then followed up the talks of Wendy Brown, Rei Terada and others. Please check back for the actual papers and please use the comment space as a way to further discuss and extend the issues raised. Occupy Davis dismantling for winter break. Linda Katehi offers her take on the Context of Student Protests. Of course, that doesn't address the fact that UC has a longer history of police violence. In California the middle class is shrinking. Oh, by the way, so are corporate tax payments. There is now a petition demanding the withdrawal of UCR's recently announced protest guidelines. You can sign it here. Mr Yudof Goes to San Francisco: Addresses Chamber of Commerce on the logic of his liberal privatization scheme. Still doesn't recognize that it is making the University worse. CSU applications at record levels. Aren't they cutting back on faculty? UCSD Students reclaim closed Library. Yudof names Task Force to investigate Davis police violence. UCR Dean of Students issues proposed guidelines telling students, staff, and faculty the proper etiquette for protest. FreeUCR responds. The Occupy movements are expanding into new areas and tactics. The Dean of Students at UCR has distributed a draft for new rules concerning protest on the Riverside campus. They are actually quite remarkable. Under the tag line "Your voice matters. Make an Impact" the Dean is proposing a system where only the most regulated protest activities are allowed on campus. Not only is Riverside proposing the usual "time, place, and manner" restrictions but they are demanding that all protests be cleared with the administration two weeks before they are to occur, insisting that protesters clear with the administration any movement they plan across campus, make sure that your protest has been "approved," and don't use sticks with your signs (i.e. the conventional way that placards and signs have been held for the last 100 years or so). Riverside is pushing these rules shortly after the Regents' November Meeting and in anticipation of the Regent's January meeting at UCR. Clearly, at least some administrators are unwilling to meet the students except in situations where they define the rules. These rules with their "checklist" sound like planning for a high school dance. Is that really how Riverside's Dean of Students conceives of free speech and protest about matters of concern to the community? Is President Yudof's notion of the "DNA" of the University really that protest is only allowed when it meets the approval of the authorities? Is that the lesson in Free Speech the University wants to teach? But rest assured that they are happy to have your voice heard in the precise way that they want to hear your voice. Ignore those raises behind the curtain: Regents manage to find money to raise salaries of high administrators. On Tuesday, Students and Faculty at Davis debated what is to be done. 242 Davis Professors Sign Letter in Support of Katehi. Birgeneau canceled his scheduled appearance at the Graduate Student Assembly on Thursday. Occupy Cal presses UCPD Review Board to act on November 9th events. Board demurs. The many UC crises this November have prompted challenges to longstanding prerogatives of unilateral governance among UC's senior managers. In the aftermath of both cases of police violence last month, members of the UC community identified the real problem as a chronic governance failure and then directly inserted themselves into the governance process. 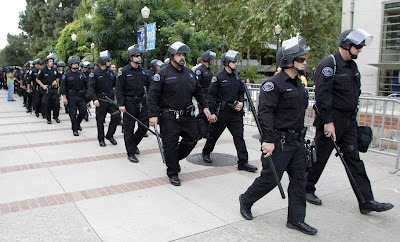 On the police front, UC officials have long affirmed the generic value of peaceful protest while carefully protecting UC managers from its effects. In the contemporary protest period that began in September 2009, campus officials have allowed most temporary protests while blocking occupations, and have gone to great lengths to insulate officials from direct contact with protesters. The police arrive for the UCLA section of the Regents meeting on November 28th. More questions about Bratton. He urged Brown University to arm its police. And in case you missed it here is the CUCFA letter to Yudof opposing the hiring of Bratton. Oh, and the Atlantic weighs in. Rei Terada and Michael Meranze point out the larger problems exemplified in the Bratton, Robinson, and Edley appointments. CSU Trustees postpone decision on executive compensation because of fear of protests. They try to make it sound as if their plans make sense. Who’s Really Making Policy at Your Campus?